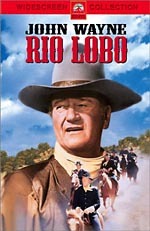 My gradual education in the films of John Wayne continued with 1959’s Rio Bravo. Sheriff John T. Chance (Wayne) arrests Joe Burdette (Claude Akins) after the latter kills a man in cold blood during a bar fight. This doesn’t sit well with Joe’s brother Nathan (John Russell), and he causes tension in the town that puts Chance on guard. Chance deputizes alcoholic gunslinger Dude (Dean Martin) and elderly coot Stumpy (Walter Brennan), as they’re about the best he can do on short notice. They prepare for an inevitable attempt by Nathan and his cohorts to break out Joe. Wagon master Pat Wheeler (Ward Bond) offers the services of his men, but Chance declines since he thinks the amateurs will get in the way – except for young hotshot Colorado (Ricky Nelson), who becomes part of the posse. A woman with a shady past (Angie Dickinson) starts to fall for Chance, and she also joins their group. They try to hold out against attempts to free Joe Burdette. Although the DVD offered my first screening of Bravo, I didn’t go into it blind. 1976’s Assault on Precinct 13 - and by association, its 2005 remake - liberally borrowed from Bravo. They updated the story and put it in a different setting, but the basics remained the same. Of those three, the original certainly seems to be the best. The Assault remake was a stinker, while Carpenter’s version was an iffy pleasure. Actually, I liked it in most ways, but its low budget, amateurish origins made it less than satisfying at times. None of those issues mar Bravo. In no way could I call the production “amateurish”, as it boasts fine production values and many other strong elements. Obviously Bravo comes with the best director via the legendary Howard Hawks, and the acting talent also stands out as a positive. I must admit that factor surprised me. I respect Wayne as an icon but maintain my doubts about his performance skills. Nonetheless, he provides a terrific turn as Chance, though. The Duke offers nice depth to his character, as he presents strength and honor but doesn’t turn Chance into a cardboard, stoic stud. Wayne also makes sure we see the role’s fear and uncertainty; this is a rounded performance that makes the character memorable. The supporting cast also does well, with another surprising positive from Martin. I think of him as a comedic presence, not a dramatic actor, so his rich work as Dude is a revelation. Martin doesn’t rely on cheap drunken gimmicks. He lets us see his flawed character’s pros and cons in a fine manner and adds real heart to the flick. In theory, I might complain that Hawks takes quite a while to move along the story. At 141 minutes, this is a long movie for a pretty basic story, and it starts to drag at times. Nonetheless, Hawks occupies our attention well enough so that the slow spots don’t linger. Bravo boasts good natural character development and it allows for the personalities to grow and change in a believable manner. The film also dollops out exposition in a realistic way and evolves naturally. The first half suffers somewhat from a paucity of action, though Hawks makes sure it’s not just talk. We get a smattering of livelier scenes to maintain our attention before the long climactic battle sequence. This factor allows the tension to grow ala something like High Noon. We know what’s coming, so the movie toys with us and makes us wait for it. All of these factors turn Rio Bravo into a memorable western. An involving tale filled with interesting characters, it creates a good little action piece. The movie keeps us with it despite some slow spots and ends up as a winner. 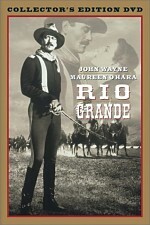 Rio Bravo appears in an aspect ratio of approximately 1.85:1 on this Blu-ray Disc. The film came with a pretty average transfer. While “average” doesn’t mean “bad”, I must admit that the image looked worse than I’d expected based on current standards. Source flaws were one moderate concern. Grain could be a bit heavy, and I noticed a mix of specks and marks through the flick. Though these weren’t prominent, I thought they seemed more noticeable than expected. Sharpness also demonstrated some issues. Definition usually seemed fine, but the shots could turn somewhat soft at times. I didn’t think these tendencies became terribly distracting, but they left us with a less than concise image at times, mainly during some interiors. Jagged edges and shimmering weren’t an issue, and I didn’t see any edge haloes. Colors were mostly fine. The movie came with a rather brown tone much of the time, and this could make the result somewhat drab. Still, the hues usually seemed fine within the cinematic constraints of the setting, and they could look fairly peppy when allowed to do so. Blacks were appropriately dark and dense, while shadows showed nice delineation. At all times, the transfer appeared perfectly watchable, but it lacked the spark I anticipated. As for the DTS-HD MA monaural audio of Rio Bravo, it appeared fine for a more than 50-year-old flick. Speech could be a little thin, but the lines showed reasonable warmth and never suffered from any form of defects. Music lacked great dimensionality as well, but the score showed acceptable clarity and definition. Effects came along the same lines, as they were clean and without distortion but they failed to present much range. Some light background noise cropped up at times. This was a competent track for its age. How does the Blu-ray compare to the DVD from 2007? The audio remained restricted due to the limitations of the source, but I thought the lossless DTS-HD MA mix had a little more range. Visuals seemed better defined and clearer. The Blu-ray’s image showed some of the DVD’s concerns and I’d not be surprised to find out it came from the same transfer, but the capabilities of the Blu-ray format made it the superior presentation. The Blu-ray replicates some of the DVD’s extras, and we open with an audio commentary from filmmaker John Carpenter and critic/film historian Richard Schickel. Both provide separate running, screen-specific tracks edited into one piece. They discuss cast and crew, story, characters and themes, sets and locations, music, and Hawks’ style as a director. When we hear from Carpenter or Schickel, they offer some fine information. Schickel provides the majority of the material and he even presents some criticism of Bravo, a welcome choice given the preponderance of praise usually found in commentaries. We find nice insights into Hawks’ preferences in terms of visuals and story, his self-plagiarism, and the impact of his dislike of High Noon on Bravo. Too bad we encounter so much dead air during this commentary. This doesn’t turn into a problem during the movie’s first third or so, but after that, we find lots and lots of gaps. Given the presence of two participants, this becomes a real drag. I think the track’s informative enough to overcome the flaws, but the problems make it less impressive than it could have been. 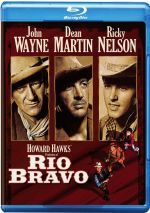 Commemoration: Howard Hawks’ Rio Bravo runs 33 minutes, 23 seconds as it blends movie clips, archival materials, and interviews. We hear from Carpenter, filmmakers Peter Bogdanovich and Walter Hill, UCLA Department of Film and Television’s Jonathan Kuntz and Steven Mamber, Howard Hawks Papers’ curator James D’Arc, and actor Angie Dickinson. We also find some old taped comments from Howard Hawks. “Commemoration” looks at how Bravo acted as a personal reflection on Hawks and where it fit into his career at the time. The program lets us know of TV’s influence, the period popularity of westerns, and how these affected Bravo. In addition, we learn about casting and performances, the script, shooting the flick and related subjects, Hawks’ tendencies and their role in Bravo, some censorship issues, and the movie’s reception. Only one modest problem occurs during “Commemoration”: repeated information from the commentary. Of course, if you skipped that track, this isn’t an issue, and it’s not a major concern either way. Despite some repetition, “Commemoration” offers a rich, incisive piece. It covers the nuts and bolts of the film well and also digs into various forms of subtext. I find a lot to like in this tight program. In addition to the film’s trailer, we find the eight-minute, 34-second Old Tucson: Where the Legends Walked. It features Kuntz, Old Tucson Studios tour guide Dan Schneider, Old Tucson Studios former owner Rob Shelton, and Old Tucson Studios entertainment manager Mark Kadow. We get info about Old Tucson Studios with an emphasis on its use in Bravo. The short piece gives us a nice examination of the locations. Note that although Rio Bravo already appeared on Blu-ray in 2007, this disc does not simply reissue that one. I didn’t see the original BD so I can’t directly compare them, but I know the 2006 disc lacked the 2015 version’s DTS-HD MA track. On the negative side, the old Blu-ray included a documentary that goes missing here. Despite its length and casual pacing, Rio Bravo deserves its status as a classic flick. The movie involves us with its simple but powerful story, lively dialogue and interesting characters. The Blu-ray offers decent picture and audio along with few useful supplements. While I can’t call this a great release, it serves a strong movie reasonably well. 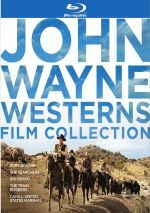 Note that Rio Bravo can be purchased on its own or as part of a five-film “John Wayne Westerns Collection”. 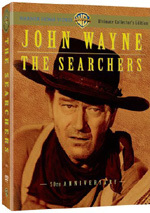 This also includes Fort Apache, The Searchers, The Train Robbers and Cahill: United States Marshal. It retails for $54.95, so it’s a good deal if you want all five of the movies.